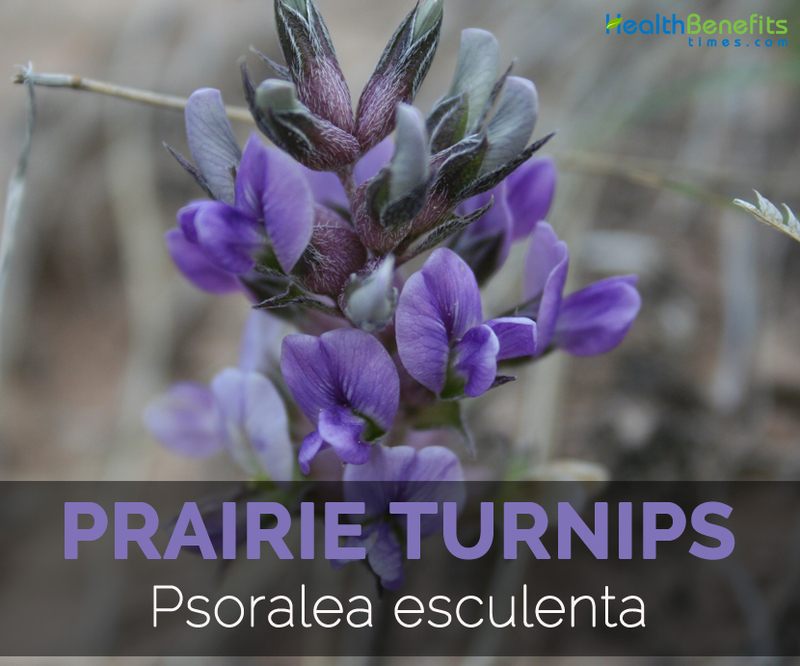 Prairie Turnips (Psoralea esculenta) is a root vegetable commonly grown on well-drained soils for its starchy tuberous root. 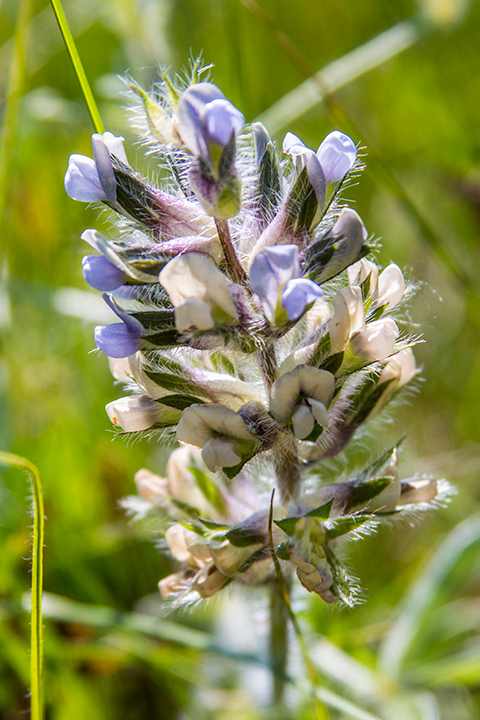 Other common names of Prairie turnips are Prairie Turnip, Tipsin, Indian Breadroot, Timpsula, Scurfpea, Teepsenee, Tipsin, Breadroot scurf pea, Breadroot, Pomme blanche, Large Indian breadroot, Pomme de Terre and Tipsinna. Native to prairies or dry woodlands of Central North America, it belongs to the family Fabaceae /Leguminosae and genus Psoralea. It is an herbaceous perennial plant which has alternate, oblong to egg shaped or elongate to oval leaves of 2-6 cm long. Flowers are short, cylindrical, blue or purple in color of 5-10 cm (4 inch) long. The stems are hairy of 30 cm (12 inch) in size. 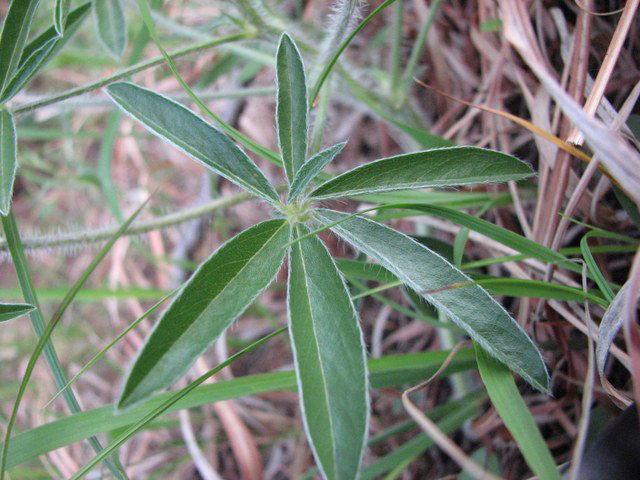 The herb possesses a tuber of spindle shape which is about 4-10 cm (4 inch) long which has a thin skin and white flesh. 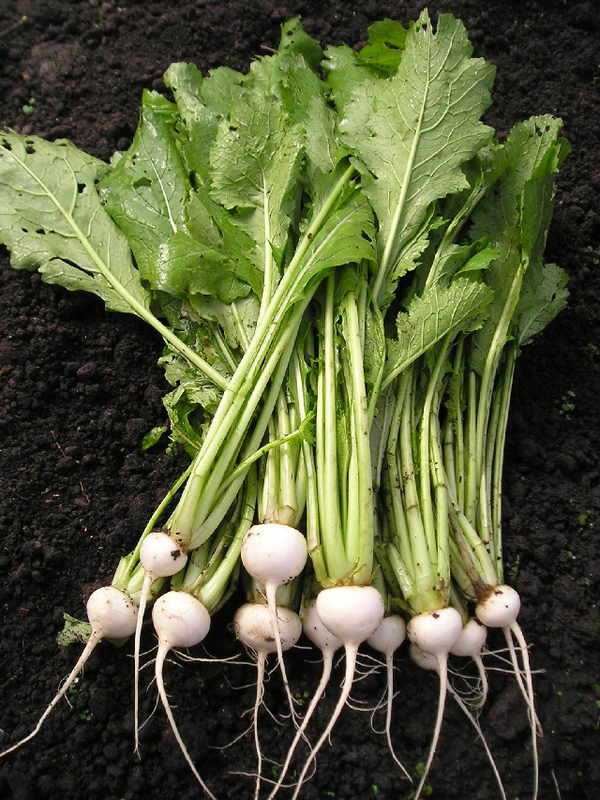 12.6 grams of Prairie Turnip provides 4.49 grams of carbohydrates, 0.33 grams of protein, 1 gram of fiber, 7.65 grams of water and 1 mg of sodium. The same amount provides 20 calories, 0.7 gm of Vitamin C, 1 µg of Vitamin B9 and 0.315 mg of Vitamin B3. Vitamin B6 is essential for the production of hemoglobin in blood which is transferred by the red blood cells to transport oxygen throughout the body and use iron. Anemia is caused due to the low production of red blood cells in the body and certain symptoms are experienced such as aches, fatigue and pain. The study shows that the adequate intake of Vitamin B6 helps to reduce the symptoms of anemia and prevent its occurrence as well. Vitamin B6 assists in the functioning and development of brains. The study shows that the deficiency of Vitamin B6 affects the memory function, results in dementia, Alzheimer’s and cognitive impairment. The studies show that the deficiency of Vitamin B6 is the contributor of Alzheimer’s disease. Vitamin B6 controls the level of homocysteine which is the main cause of heart disease along with neuron damage. Vitamin B6 is vital for creating the hormones such as norepinephrine and serotonin which assist in managing energy, mood as well as concentration. Research shows that ADHD in children are caused due to the low level of serotonin. So the intake of Vitamin B6 leads to the positive effect on improving behavior and learning disorders. Selenium has an ability to encounter the aging process and assist immune system by lowering the damage cause by the free radicals. Selenium has a harmonious effect along with the antioxidants such as Vitamin E which facilitates the body to fight against oxidative stress and prevent the chances of colon cancer and prostate cancer. Selenium is a basic element of glutathione peroxidase which is a vital enzyme for process that safeguards the lipids in cell membranes. Selenium is essential to encounter the DNA damage, mutation and oxidative degradation of cells that contributes to various diseases. The low presence of selenium is related to the high chances of cardiovascular disease. The supplements or foods rich in selenium help to prevent the coronary heart disease. It combats an inflammation, reduces the oxidative stress caused by free radicals, increases the flow of blood and has antioxidant properties. The study shows that the chronic asthma patients has low amount of selenium. The intake of selenium supplements by the asthma patients help to reduce the chances of symptoms associated with asthma. The supplements of selenium may treat the chronic asthma effectively. Yet more research is still required to find out the full effect of selenium on the function of lungs. The intake of selenium is beneficial for enhancing the anti-cancer ability in the body. The studies show that selenium helps to reduce the chances of cancer effectively such as prostate, liver, lung and colorectal cancer. Selenium activates selenoproteins which assist the antioxidants to perform its job. The selenium slows doen the growth of cancer, its progression and growth of tumors. The studies show the high intake of selenium prevents the DNA and reduces the chances of cancer development and mutation of cells. The evidence shows that the diet rich in fiber helps to prevent obesity. The intake of fiber is inversely related with the body fat and body weight. Fiber makes feel fuller which helps to prevent overeating or snacking in the next meal. The diet rich in fiber reduces the intake of food which assists in low body weight. Fiber also reduces the toxin absorption and change the secretion of hormones in gut. Iron assists in transporting the oxygen to the cells. 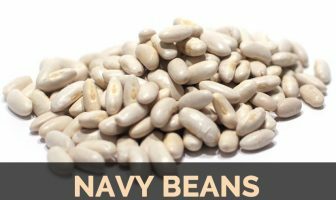 It helps the metabolic enzyme process which is carried out by the body to absorb nutrients and digest proteins which is obtained from the food. The deficiency of iron leads to exhaustion, feel sluggish and problem in being active. The low presence of iron contributes to the symptoms such as mood change, low concentration and problem in co-ordination of muscles. Iron is essential for the movement of muscles as it stores oxygen in the muscles which allows strengthening and movement of muscles. Magnesium is required for the formation of bones and controls the activities of osteoclasts and osteoblasts that help to maintain the density of bones. Magnesium helps to balance the concentrations of blood of Vitamin D, which is a main regulator of bone homeostasis. The research shows that the high intake of osteoporosis helps to prevent osteoporosis and prevent the deficiency of magnesium. Calories 20 Kcal. Calories from Fat 0.45 Kcal. Calories 18 Kcal. Calories from Fat 0.04 Kcal.